These are cast aluminium expanded water jacket plates to allow improved water circulation around the cylinder walls. The plates have an offset internal boss for those who wish to have a manifold take-off to the C/J4 water pump arrangement. We can incorporate a water manifold for the water pump take-off if requested. We also supply the flywheel housing/engine block torque brackets which bolt to this product although please advise if you intend to use these with our water jacket plates as we will incorporate some additional machining to the water jacket plates and at no extra cost. Nitrile rubber gaskets for the C, M, D and J Types as well as the OHC Morris Minor are now available to complement this set. The outer rubber profile has been drawn up to perfectly match the machined block face to eliminate any untidy overspill of the gasket itself and the scew holes are all cut undersize to assist sealing. Nitrile rubber gaskets are resistant to the petrol ethanol additive problem which is becoming a progressive issue in the continued running of vintage cars. We also supply stainless steel original profile water jacket plates for M, C, D and J Types and OHC Morris Minor and for the P & L, K, N Types as well as for the F Type (which also fit the Wolseley Hornet Special). 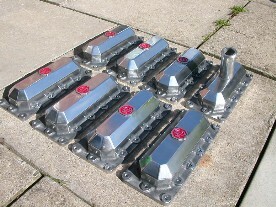 Price POA -per pair for highly polished finish and with painted relief MG logo. Please note that when using on the M Type, the oil return pipe from the cylinder head needs to be modified. Please also note that when using on the M & J Type as well as the OHC MM engine, the dipstick arrangement will need to be relocated to the sump. We refer you to the Sump Mounted Oil Dipsticks and Holders – J Type.